These are the videos you have to see if you want to be an anime fan, the videos that hooked the fans who came before you. These are the videos that show why anime is great. Perhaps you are new to anime, so a fuller-than-usual explanation is given. As well as short reviews, pointers for more information, and tips on how to get the videos, are given. There is a lot of information on the WWW about popular anime videos, so I don’t feel obliged to repeat long synopses, pictures, etc. See also Post-1987 “Recommended” in the drop-down menu. A near-legendary anime director, Miyazaki, working with Studio Ghibli, has scripted and directed a number of great anime movies. 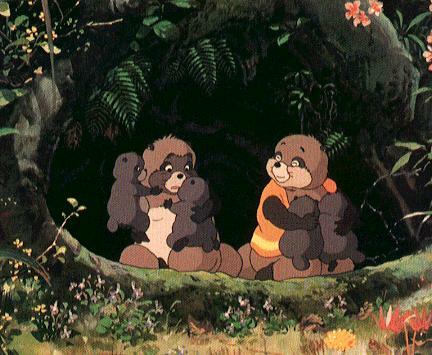 If you meet Japanese adults, you may well find that even if they don’t know anything about the average anime and care less, the Miyazaki movies are the ones they let their kids watch. Nausicaa (Kaze no Tani no Nausicaa), 118m, 1984. Literally, “Nausicaa of the Valley of the Wind”. Considered by some to be Miyazaki’s best, and one of the finest animated movies ever. Princess Nausicaa lives in a world of the future, devastated by war and pollution, and slowly regenerating itself into a rather alien place, infested with giant insects. Meanwhile the surviving humans continue attempts to destroy each other. Nausicaa has to help her people when they are invaded, and overcome hatred and violence, not least within herself. The sound-track music is very fine too. Literally “Laputa, Castle of the Sky”. Another masterpiece, again featuring Miyazaki’s fascination with flight. Sheeta falls to earth from an airship attacked by air pirates, and is found by an orphan boy, Pazu. There follows an action-packed chase as Sheeta is pursued by both the pirates and the secret police, who want the “levitation stone” she wears around her neck, a key to the mysterious flying island, Laputa. Muska, the leader of the secret police, is, like Sheeta, a descendant of the rulers of Laputa. Will cute Sheeta melt the pirates’ grasping hearts? Everything is perfectly realised, from the mining village (inspired by a visit to Britain), to the airships, to the vegetation. Somewhat in contrast to the previous two movies, this is an idyllic vision of country childhood. Mei and Satsuki move to an old house in the country to be nearer their mother, who is in a sanatorium. Their father catches the bus every day to go lecture. The girls encounter some woodland spirits – the Totoros. Literally “Prick up your Ears”, a.k.a “If you Listen Carefully”. From Studio Ghibli, dir. by Yoshifumi Kondo, script by Hayao Miyazaki (who also directed a short computer-generated section of the movie). Young Shizuku, who lives in a modern Japanese city, finds her attention drawn to a boy, Seiji, who she initially dismissed as uninteresting, but who has been reading the same books. 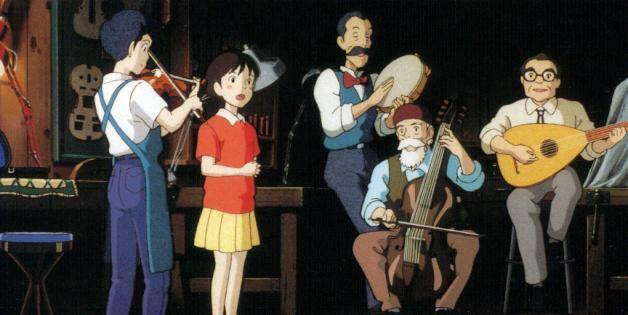 She follows a cat to a small shop full of wonderful objects, and, inspired by Seiji’s passion for violin-making, asks if she can write a story about a cat sculpture, the “Baron”. Set in medieval Japan, this has as major characters a young man, Ashitaka of the Emishi clan, descenant of a defeated royal house, and a woman, Eboshi Gozen, leader of a group of ironworkers, whose fortified community is under attack by giant white wolves led by Princess Mononoke. Mononoke represents, obviously, the embattled forces of nature under threat from man’s activities. Despite their quality, several of the Miyazaki/Studio Ghibli movies remained unreleased in the West for decades. However at last (2006) almost all of them are available on DVD in the US, UK, Asia, etc. World copyright has been acquired by the Disney Corporation, thus making distribution of fansubs illegal. Ghibli Info. made, and as a thoughtful piece of SF moviemaking. UK release, US release (125m), dub & sub. the US fan script from the INTERNET. A classic alien invasion/horror anime that powerfully pitches the naive viewer headfirst into an alien universe. It’s stylishly made, with rather sympathetic aliens, convincing looking sets, strange symbolisms, and tentacled horrors that make the first-time viewer jump. The Earth is defended by the android Iczer-1 (of female appearance) aided, rather unwillingly, by a terrified Earth girl, Nagisa. This is the only anime in which a giant robot gets to stomp on a little girl. Not a single video, more of a Rumiko Takahashi industry. Stupid Japanese schoolboy Ataru gets mixed up with a bikini-wearing alien girl (Lum) and a lot of other annoying aliens, to the disgust of his nice girlfriend, Shinobu. I suggest you check out the first TV anime volume (or the manga) to learn who everyone is, then sample 1 or more of the 6 movies. US & UK subtitled releases. See database entries. This is not a single video, but a mini-industry, again based on a Rumiko Takahashi manga. Ranma goes on a martial arts training trip with his dad, but they fall into a magical pond, with the result that every time Ranma gets wet he turns into a girl. And Dad turns into a panda. Dad tries to marry Ranma off to a girl (Akane) whose father runs a martial arts dojo. It’s a great comedy, with moments of thoughtfulness. I’ve watched the first episode any number of times. You get the essence of Ranma 1/2 if you watch the first 7 or so TV episodes. If you want to carry on and watch scores more episodes, the two hour-long OVAs or the later short OVAs, that’s up to you but you might find it palls. US sub & dub releases. UK video release. See database entries. A recent TV series (26 episodes), Escaflowne is one of the all-round best anime TV series made to date, with a strong series-long story and plenty happening in each episode. With a brave schoolgirl heroine, an alternate world, and bits of school story, fantasy, SF, romance, giant robots and so forth it covers all the bases. Hitomi Kanzaki, a 15 year old girl interested in athletics and fortune-telling, is whisked into an alternate world by the agency of a pendant she got from her grandmother. Once in Gaia, she finds herself called “The Girl from the Illusory Moon”. All the characters appear as individuals integrated naturally into the story. The quirky designs look a bit shoujo -ish. The series does take a bit of getting into. I advise you view the first 4-episode volume, preferrably with subtitles & hifi sound, before being put off. US,UK DVDs. For Special Feature see “Features” drop-down menu. One of the most vivid and archetypal shoujo anime TV series, in which a naive 15 year old girl, Nanako, is admitted to an exclusive girl’s school which proves to be a hotbed of rivalry and ill-repressed emotions. On her first day the beautiful Shinobu befriends Nanako with an enthusiasm that seems rather excessive… Meanwhile the tall and artistic “Saint-Juste” wilts hopelessly, while the lovely “Miya-Sama” rules her exclusive sorority with an iron will. Many snobbish girls are enraged when homely Nanako is voted into the Sorority. This series features adult themes and situations; definitely not for juveniles. The character designs are often ravishingly beautiful and the atmosphere generated by the story is intense. Again, not a single video but a six-video series. It features three schoolgirls: A-Ko (red hair, very strong), B-Ko (blue hair, very clever and scheming) and C-Ko (yellow hair, very feather-brained). A-Ko and B-Ko are best friends, but B-Ko wants C-Ko for herself and will go to ANY lengths to get her way. Cue destruction, home-made giant robots, etc. And C-Ko is really an alien princess. Cue space-ships. Classic anime comedy. Check out either the Project A-Ko movie (1986) or (my favourite) the Plot of the Daitokuki Company (first OVA). If you like that, check out the last two OVAs (Blue/Gray) which form an alternate side-story. US, UK, 1988, poss. now unavailable. AKA “Tombstone of the Fireflies”. a.k.a. “Once Upon a Time”. A beautiful story about love, greed, betrayal and death, that deserves to be better known. A young man living in a rural community is offered rewards to spy for one of two powers engaged in a bitter struggle over water supplies. The prince of one country and the princess of the other are in love, yet are forced to serve their warring countries, with tragic results. The spy is largely responsible for the destruction of the low-lying country, and his own love does not escape. a.k.a. Clash of the Bionoids, etc, etc. 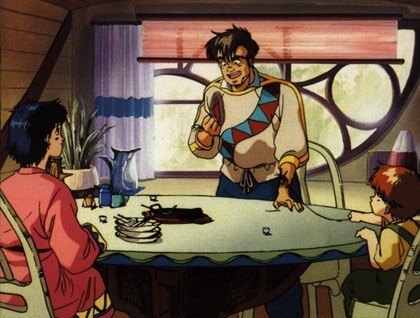 A variant of events in the first Macross TV series, it has some fine battle scenes and gloomy romantic moments. And seen on a projection screen, the art is pretty good. Caution: just possessing an uncut copy of this can get you into trouble in some countries. UK: movie version (cut), US: various versions including uncut. Don’t show it to your lowlife friends ‘cos they’ll drool over it and demand a repeat showing. How else do you think Manga Video made so much money? Far too many sequels, increasingly rubbishy and unnecessary. Great blog here! I find myself unable to muster the energy to follow up on new anime like I used to… so your list and reviews are great to get a sense of what’s going on beyond friends’ recommendations.